How many times will civilians in the world’s youngest nation be forced to flee their homes, knowing that if they don’t their lives will be in danger? 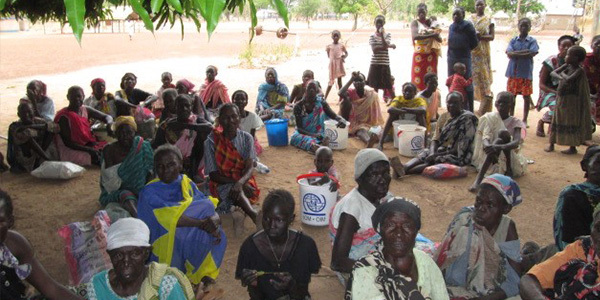 Renewed conflict in Wau has opened a new chapter in the civil war, creating a catastrophe of biblical proportions. Each new attack continues to tear people from their homes, and in many cases, the small plots of land that sustained them and their families. This man-made disaster is driving the country into deeper despair; nearly 2 million people are internally displaced, thousands of innocent civilians have been killed, and parts of the nation have plunged into famine. Will you please give what you can today to help your suffering brothers and sisters in Christ? 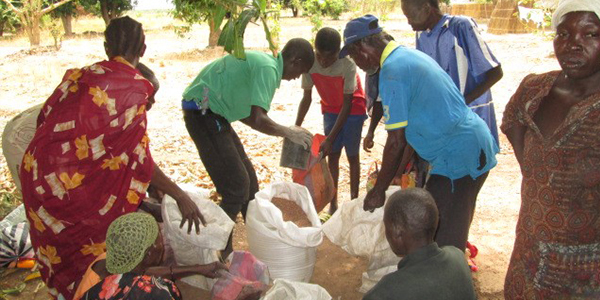 Your continued support is needed to reach those who are truly destitute and starving. HUNGRY CHILDREN AND FAMILIES NEED YOUR HELP: DONATE NOW! 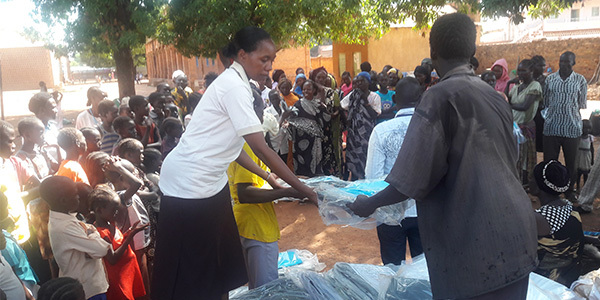 Sr. Anne handing out mosquito nets donated by the Sudan Relief Fund. As periodic fighting continues, the world’s fastest-growing refugee crisis isn’t slowing down. Panicked communities are seeking refuge wherever they can: neighboring countries, schools, around the perimeter of the local UN base, and in the grounds of St. Mary’s Cathedral in Wau. In February, our team visited St. Mary’s Cathedral to complete an emergency food request when it was hosting 3,000 internally displaced persons (IDPs). Since then, that number has grown exponentially. The oldest cathedral in the country is now home to 16,000 IDPs, hoping the church grounds will keep them safe as their country spirals into greater violence. Those who sought refuge at the church are mostly women and children, who are living in fear and bearing the brunt of violence. The new wave of arrivals has stretched the capacity of St. Mary’s Cathedral and has hundreds of people living in the open air, without shelter. The congested church grounds is lacking basic necessities such as food, clean water, and other life-saving humanitarian aid. Since humanitarian response within the compound is no easy task, our team has partnered with Sister Anne Wandia, who is a member of the Franciscan Missionary Sisters for Africa. Sr. Anne is stationed at St. Mary’s Cathedral and helps refugees by distributing life-saving food in the compound to those who need it most. She recently reached out to our team, pleading for an emergency food request. Sr. Anne tells us the flight of people from their land is exacerbating food needs and is worsening famine. Please, give what you can today, so we can lend our support and provide desperately needed relief. People are starving, and there is simply not enough food to go around. 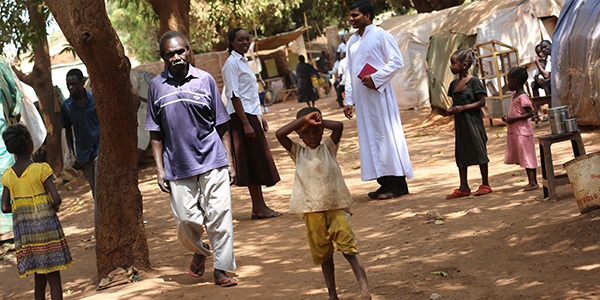 More humanitarian aid is needed to help the IDPs who make the cathedral grounds their home. It’s hard to imagine the chaos that drove tens of thousands of people to seek refuge at St. Mary’s Cathedral. One of the compound’s recent arrivals is Rita Williams, a mother of three. She fled with her children after soldiers broke into her home. Although the challenges that face this war-torn country seem insurmountable, refugees remain incredibly resilient, even in the most difficult of situations. Father Moses Peter, the diocesan emergency coordinator, says the victims of the violence trust the clergy to protect them. “Most felt when they came to the church that God was immediately going to look after them and keep them safe. And many felt that if people came to do violence, that we priests would challenge them,” he said. Please send a donation today to help the innocent victims of this terrible war. With your gifts, and the help of Sr. Anne, we can make an impact by sending life-saving food and also help to provide other critical essentials like emergency supplies, safe drinking water, and shelter. Refugees are counting on supporters like you to bring them hope, security, and sustenance. A donation of any amount can help bring joy to the hearts of many people in suffering. P.S. We are at a tipping point and we need to move quickly. One small gift can make a powerful difference by delivering food and clean drinking water to those who need it most.